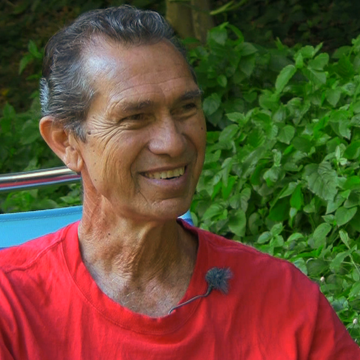 Walter Ritte (2012), a community leader who lives off the land as a homesteader and deer hunter on the island of Moloka’i, is a longtime advocate for protecting the land and for Hawaiian rights. As a member of Hui Alaloa, Ritte helped organize protest marches to restore the Hawaiian Kingdom’s access rights from the state of Hawai’i so that traditional hunting and fishing practices could continue. Ritte also helped lead the 1970s community organization Protect Kaho’olawe Ohana (PKO), in which he served as one of the original “Kaho’olawe Nine” (Hawaiian activists who landed on the sacred island of Kaho’olawe in 1976 to protest its bombing by the U.S. military.). Deeply concerned that “our economy is at war with our natural resources,” Ritte has worked for years to encourage a sustainable lifestyle and oppose the massive corporationization of our food industry, which includes altering our foods through genetically modified organisms (GMO) and sterilizing our soil. In 2012, Ritte was running for a seat in the Office of Hawaiian Affairs (OHA) when Eiko Kosasa interviewed him.